With 300 million active users LinkedIn is the most popular professional network in the world. It is used by professionals looking for work worldwide, employers and HR professionals looking for employees or for establishing useful contacts. Read these detailed instructions on how to establish and correctly complete your profile on LinkedIn. Each social network requires registration and LinkedIn is no exception. 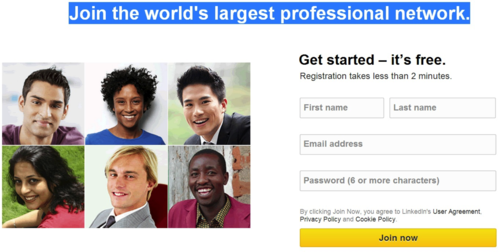 Simply visit the homepage, where you will be welcomed by the words “Join the world's largest professional network”. There is a short form to the right below the title, where you can enter your name, surname, e-mail and password. You will use this information to log-in to LinkedIn. After completing the form, click on the “Join Now” button, which will transfer you to the next form. Enter information about your address and current state of employment – employed, seeking work or student - in this form. Depending on your state of employment you can enter additional information about your current or previous job and give the name of the company or school you are currently with. Then click on the “Create my profile” button. After completing the previous steps you will need to verify your e-mail address, the one you entered at the beginning of the whole process. 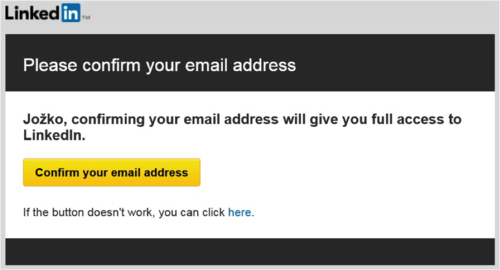 Check your inbox, open the received email and click on “Confirm your email address”. Congratulations, you have activated your account. Now you need to complete several steps that will help you to start your profile. LinkedIn will ask you to enter your e-mail address again and will propose a list of people you have in your contacts on other networks. This will allow you to find friends who already have an account with LinkedIn much more easily. Networking or establishing and maintaining professional contacts is a very important part of your professional life. Before you begin refining your professional profile choose the type of account. You can choose from a Premium subscription (from £19.99 per month) or the free Basic account, but has restricted functions and options. The Basic account will be sufficient for the beginning, and you can change it to Premium at any time. LinkedIn will now guide you through completing your profile step-by-step. Gradually fill in the following information: Experience Skills & Expertise, Education, Languages and Photo (profile photographs). Don’t worry, you can change your profile again at any time by clicking on “Edit profile” – to the right of your profile photograph. We recommend that you fill it in in English, but it depends on you and your ambitions. Be brief, informative and don’t give false information. Enter information about your current job in the Experience field. Don’t forget your previous work experience. Give the name of the company, position and time period. You can increase your creditability by adding a brief description of the activities you carried out. Enter the highest level of education you have achieved in the Education section. Don’t be afraid to enter precise data on when you completed your studies and try to remember the activities you carried out during your studies. In the Personal Details section you have the opportunity to publish personal information such as your date of birth and marital status. You can also determine who will be authorised to see this information. The Interests field is for entering your hobbies, interests or the activities you carry out outside work. Don’t be shy about revealing your strong points. Give your skills and expertise in catchwords. It will be easier for HR specialists to find you on the basis of this information. Individual skills will also enable your colleagues and friends to evaluate and increase the attractiveness of your profile. Give a brief summary of your personality, professional direction and your spheres of activity. Regularly update the Summary section so that it describes your current focus as accurately as possible. You can also upload pictures, videos, presentations or text documents to LinkedIn. Create a portfolio of the work you have been involved in. Visual content is very important on the internet, so don’t be afraid to integrate it into your profile.